February 28, 2017 – Cineplex has seen a 12% drop in attendance in the fourth quarter of 2016. Should the performing arts sector rejoice or be scared? Neither. But it should certainly pay attention. In a radio interview with the CBC, CAPACOA's Frédéric Julien explained that art goers are omnivores: the person who regularly attends live concerts is likely to be also a movie goer. Consequently, whatever affects one industry is likely also affect other parts of the ecosystem. To have a better sense of what's going on, let's have a look at the latest data from Statistics Canada. 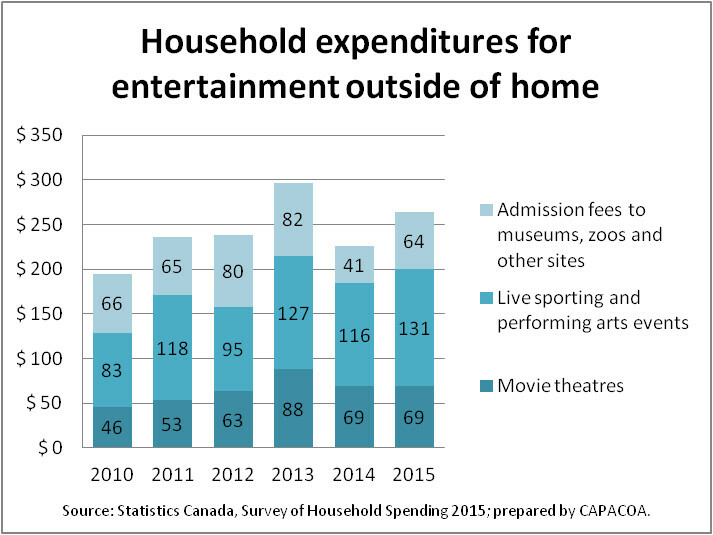 According to the Survey of Household Spending, Canadians are spending less for movie theatre, but they have spent more in 2015 for live sporting and performing arts events than in any of the previous five years (that is, since the two categories were amalgamated by Statistics Canada). On average, Canadian households spent $131 for live events in 2015, compared to $116 in 2014 and $127 in 2013. This might, at first sight, look like a good news. However, we're no longer observing the kind of sustained growth in live performance spending that we had seen in the early 2000's. In addition, 2010 was a downturn recovery year, and is a poor benchmark year. Then, an increase in spending can be the result of higher ticket prices (observed in the latest TAPA Stats Report) rather than an increase in the number of tickets sold, which could be indicative of issues with price elasticity of demand. Finally, if we step back and take a broader view – the cultural omnivore view – overall expenses for entertainment outside of home do look like they have reached a plateau. Last year, CAPACOA published a more complete analysis of the Survey of Household Spending. It revealed a displacement not within recreation expenses (which include sports and recreation services, home entertainment equipement, package trips, etc. ), but rather from recreation expenses to communications expenses. This trend continued in 2015. While recreation expenses were back on the increase (driven in part by... children's toys!) following a decrease in 2014, communications kept progressing steadily by 4%, with the largest percentage increase acrruing to online services. In the end, communications expenses have grown twice as fast as expenses for entertainment over five years. These statistics beg several questions. Is the plateauing of leisure spending really the effect of a spending displacement or is it also a consequence of Canadians having less discretionary income than they used to? Could the time crunch also be at play – after all, leisure outside of home requires a greater time commitment than online modes of consumption? 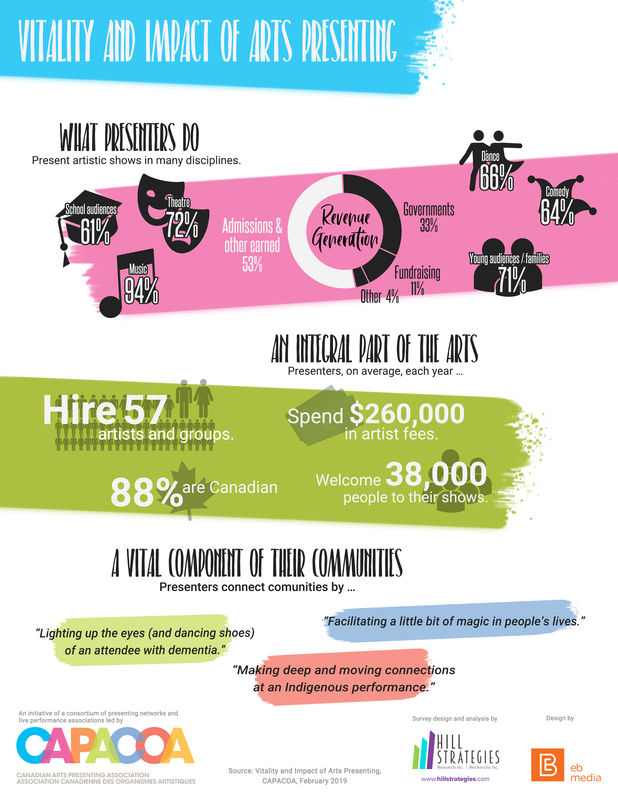 What is the impact of free arts activities on these statistics and on the business model for the live performing arts? If there is indeed some form of competition between live performing arts, movie theatres and online modes of consumption, and what are the competitive advantages and barriers of each one in terms of the consumer experience? For example, the performing arts may not have long ads running before each show, but they can't claim to have the best ticketing experience either. We will try to address some of these questions in an upcoming Arts in Perspective conversation entitled A Night Out, on June 7. Attendance if free, but active participation will be expected: by the end of the conversation, you will have generated your own actionable insights.